Reflecting on what we’ve learnt over the past few weeks. by Rafael Prieto Curiel, Nikoleta Kalaydzhieva and Sean Jamshidi. Published on 31 October 2017. 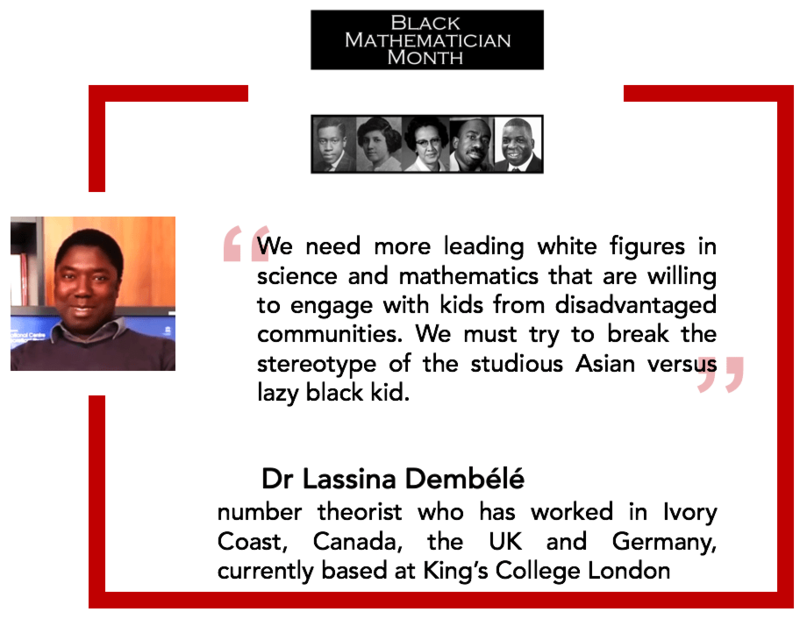 This October, we have been celebrating Black Mathematician Month. 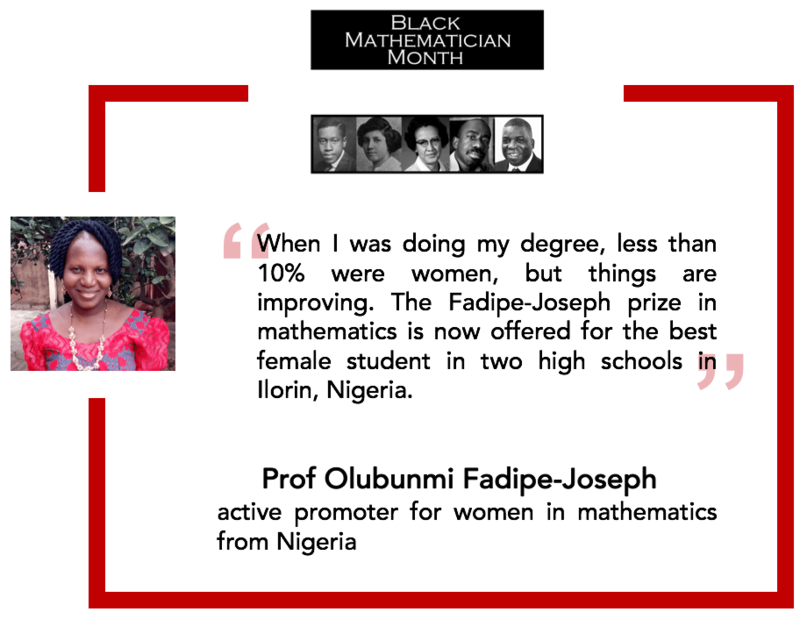 The objective was, firstly, to promote the work of black mathematicians from around the world, highlighting the crucial role they play and their successful careers. Secondly, we aimed to show how society can let down black mathematicians, often (but not always) without realising it: from the kid at school who is convinced by their teachers not to become a mathematician “because is not for them” to the professional mathematician who assumes that a black person at a conference “is part of the cleaning staff”, to more explicitly racist events. Over the past few weeks, we have spoken to mathematicians who have worked in Europe, North America and Africa. From an Oxford PhD graduate who works in the ‘sexiest field in science’, to a Nigerian professor who has set up a prize for women in mathematics in her name and from a globe-trotting number theorist to a woman who describes herself as a mathematician, professor and activist, everybody has had a different story to tell and a different perspective. But many ideas cropped up time and time again. A central theme was the publicising of science, the importance of being seen and engaging with communities that, for many reasons, might not otherwise see a career in mathematics as a viable option. Another theme that was repeated by almost everybody that we spoke to was the need for support at every level, from high school all the way up to early-career researchers. The importance of good and compassionate mentors is clear. From family and friends to teachers and professors, there is something that we can all do to help improve diversity in mathematics. Fortunately, the mathematics community around the world is becoming increasingly aware of the small proportion of women involved in mathematics and strong efforts are in place to try to fix this severe problem. Other minorities in our field, however, are often overlooked. 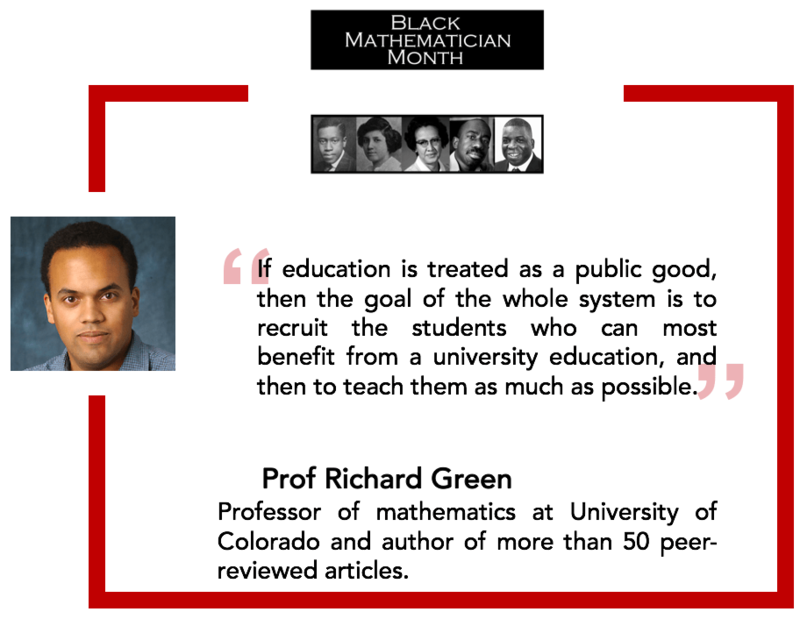 Through the whole month, many people, associations and institutions have joint their efforts to promote Black Mathematician Month. There is strong evidence that suggests there are severe issues with representation of ethnic minorities in academia. Anyone who works in academia has noticed that the number of black faculty drops significantly at higher levels, with the numbers in the highest positions at universities being staggeringly low. Although science and mathematics are about obtaining new results and pushing the frontiers of our knowledge, science is carried out by scientists, theorems are proved by mathematicians and every single model or equation has a human story behind it. Therefore having a segregated community, one in which a black professor is forced to leave their job and city in the 2000s by the Ku Klux Klan, one in which a black woman is assumed to be part of the cleaning staff, one in which you have to be the lucky person not to be discouraged to do science, is not acceptable. We cannot be blind and care only about the outcomes of the scientific community, we need to actively care for the people involved. The first Black Mathematician Month has finished, but hopefully, it leaves two lessons behind. First is that the awareness of potential racial issues is crucial. Being aware of the times in which minorities are treated differently, hearing their stories and what they have to deal with, perhaps on a daily basis, does bring light to an often-ignored problem. What have people of colour working in your school, laboratory or university experienced in their careers? What do they do to cope with discrimination? Secondly, Black Mathematician Month shows that we all actively need to construct a better mathematics community. We all need to destroy the intellectual stereotype. Regardless of our role, we can all contribute to a more equal society. Whether we are the empathetic classmate, the inspirational teacher or lecturer, the tolerant colleague in a conference or the panel organiser who strives to have a diverse range of speakers, we all play an active role in how our community currently is and we can all make it better. We have come a long way since, less than one hundred years ago, the first black person was awarded a PhD in mathematics and his transcript had the word “colored” printed across it to mark the racial difference, but we are still far from a perfect community. The first Black Mathematician Month is now over, but the lessons that we’ve learnt during it can hopefully be part of building a more open community. Although we will be back again in October 2018, we will be trying to put the lessons that we have learnt into practice throughout the year. Whether it is trying to provide people with role models, gathering better data on university applications or just going out and talking about how beautiful mathematics can be, we believe that there is something that we can all do to help build a more representative and fairer mathematical community, to the benefit of all. The images attached to the quotes in this article are used with the kind permission of the people they represent. The Black Mathematician Month logo was designed by Atheeta Ching, and features images that are public domain or reproduced with the permission of the subject.